Is beer food? That's a deceptively complex question. At first, you're like, "Of course beer is food, because it's made of barley and wheat and other edible plants," but then you realize that you don't chew beer, and food is something strongly associated with chewing. But wait, soup! Soup is definitely food, and who among us has failed to conquer a bowl of soup—carrot, say, or tomato—without a single chew? But beer isn't a kind of soup, and just about every good food that isn't a soup is a sandwich (if beer were a food, it would be a good food), and beer is almost certainly not a sandwich. Beer has calories and nutrients, as do foods, but you can't pay for it with benefits received under the FDA's Supplemental Nutrition Assistance Program. You can use SNAP to pay for food at farmer's markets, though, and beer ingredients are grown on farms, which basically means the government will pay for unassembled beer. So you could argue that point either way, but let's go with Almanac Beer Company's definition: Their motto is "Beer Is Agriculture," and they have a series of "Farm to Barrel" beers, which I'm pretty sure means they are positioning beer as food. Almanac definitely hammers home the "local" angle so beloved by certain food-type outfits: One of the most prominent of the Farm-to-Barrel beers, Dogpatch Sour, is named for their San Francisco neighborhood. I love the idea of local beer for all the hippie reasons people love local businesses (beer may or may not be a food, but it is definitely a business), but mostly because beer brewed near your house tends to be fresher by the time it hits your mouth. Almanac is on the other side of the country from me, but they offered to send a few bottles my way and, hey, free beer. Almanac specializes in wild ale styles that aren't as heavily reliant on freshness as typical pale ales and lagers; they claim Dogpatch can "mature gracefully for up to three years." 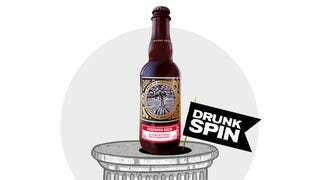 It's brewed with California cherries and a blend of wild Belgian and American yeasts, including San Francisco sourdough (wait, is this beer a sandwich?! ), and then aged in red-wine barrels for eight months. The resulting 7.5-percent-ABV homage to the Flanders red style costs about $10 per 375-milliliter (12.7-ounce) bottle, which is a fair price for this outstanding beer. It pours a pretty red-tinted brown. It's moderately carbonated, with a fluffy white head that fades away quickly. It smells like sour cherries softened by light vanilla and oak from the wine barrels, plus a strong, earthy funk. The heavily acidic character blasts your tongue on contact, but in short order, you notice the tart cherry. It is very sour, but not overly so, with caramel malt managing to peek through the strong lemon, cherry, and sourdough funk. Sour beers aren't for everybody, nor are dollar-an-ounce beers, but if you're game for this sort of thing, then Almanac Dogpatch Sour makes for some very fine eating.